Take a group of the hottest contemporary fiddle players from the Highlands and Islands of Scotland, mix with some wonderfully sympathetic piano and guitar arrangements and you’ve got the award winning Blazin’ Fiddles on your hands. And they are Blazin’, in the past decade no other band has quite captured Scottish fiddle music’s variety, energy and sensitivity like they have. Like rare single malts, each member of Blazin’ Fiddles draws the distinct flavour of music from their part of the Highlands and Islands: Bruce MacGregor from Inverness, Jenna Reid from The Shetlands, Rua Macmillan from Nairn, and Kristan Harvey from The Orkneys. Fiddles and bows come alight atop guitar and piano from Anna Massie and Angus Lyon, delivering a musically intoxicating evening for all. What began as a project for the Highland Festival almost 15 years ago, continues as one of Scotland’s top traditional bands. Blending solo and ensemble sets, aged with the occasional insightful tale, they all come together in a fiery blend to excite your senses. From remote village halls to the BBC Proms at the Royal Albert Hall, Blazin’ Fiddles has delighted audiences with their tunes and tales, whilst embodying the excitement and passion of Scottish music. This legendary, multi award-winning act never fails to set the hearts of their audiences alight. Blazin Fiddles play at The Apex on Saturday 19 June at 8pm. 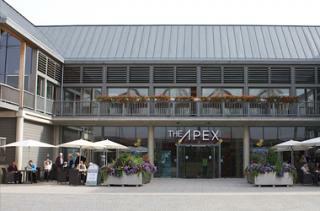 Tickets are £18 ring The Apex box office on 01284 758000 or see www.theapex.co.uk for more details or to book. Looking for something to eat or drink? Proper hamburgers and cold craft beers served with a smile!